Abby the Librarian: AudioSynced January Roundup!! There's been a lot of listening around the blogosphere in January, so without further ado, I present your AudioSynced Roundup! Have a post or review that I missed? Please leave it in the comments and I'll add it to the roundup! Didn't review an audiobook this month? Never fear, AudioSynced will be back on March 1 over at STACKED. The 2011 Odyssey Awards were announced!! The medal went to The True Meaning of Smekday by Adam Rex, narrated by Bahni Turpin and honors went to Alchemy and Maggie Swann by Karen Cushman, narrated by Katherine Kellgren; The Knife of Never Letting Go by Patrick Ness, narrated by Nick Podehl; Revolution by Jennifer Donnelly, narrated by Emily Janice Card and Emma Berling; and Will Grayson, Will Grayson by John Green and David Levithan, narrated by MacLeod Andrews and Nick Podehl. Also, don't miss the 2011 Amazing Audiobooks for Young Adults list and the 2011 Children's Notable Recordings list. Julia of Spine Label gives us the scoop on serving on the selection committee for YALSA's Amazing Audiobooks for Young Adults. Sarah of GreenBean TeenQueen has a great intro to audiobook listening where she suggests some of her favorite titles and narrators. Cory Doctorow's got a free audio download of his short story Scrooged available. I posted a review of Drums, Girls, and Dangerous Pie by Jordan Sonnenblick, narrated by Joel Johnstone. Amanda of A Patchwork of Books reviews Princess Academy by Shannon Hale, narrated by a full cast. The folks at Audiobook Heaven reviewed the entire Series of Unfortunate Events by Lemony Snickett, read by Tim Curry. Melissa of Book Nut reviews Street Magic by Tamora Pierce, narrated by a full cast. Janssen of Everyday Reading reviews Split by Swati Avasthi. Jess of The Joys of Reading posted a roundup of her January listens, including The Titan's Curse by Rick Riordan, read by Jesse Bernstein; Nightshade by Andrea Cremer, read by Rebecca Lowman; and Artemis Fowl: The Lost Colony by Eoin Colfer, read by Nathaniel Parker. Becky of Libri Delectio reviewed the Mortal Instruments series by Cassandra Clare. Melissa of One Librarian's Book Reviews discusses The Mysterious Benedict Society and the Perilous Journey by Trenton Lee Stewart. Brenda of proseandkahn reviewed many audiobooks this month and her two favorites were They Called Themselves the K.K.K. by Susan Campbell Bartoletti, read by Dion Graham and Solace of the Road by Siobhan Dowd, read by Sile Birmingham. Laura Ashlee of Ramblings of a (Future) Librarian reviews The Secret Garden by Frances Hodgson Burnett, read by Josephine Bailey; The Namesake by Jhumpa Lahiri, read by Sarita Choudhury; Sabriel by Garth Nix, read by Tim Curry; Beastly by Alex Flinn, read by Chris Patton; & Boy Meets Boy by David Levithan, read by a full cast. Lee of Reading With My Ears reviews The Prince of Mist by Carlos Ruiz Zafron, read by Jonathan Davis; The Red Pyramid by Rick Riordan, read by Kevin R. Free & Katherine Kellgren; The Other by Wes Moore, narrated by the author; Elegy for April by Benjamin Black, narrated by Timothy Dalton; & The Cardturner by Louis Sachar, read by the author. Kim of STACKED reviews Speak by Laurie Halse Anderson. And that's all I've got for you! What did I miss? Please leave a link in the comments to your January audiobook post(s) or review(s) and I'll add 'em! 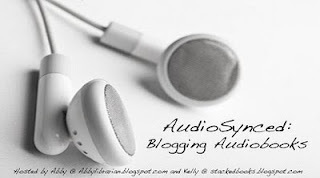 Remember, Kelly will have another AudioSynced Roundup at STACKED on March 1!